Sometimes, you just get the urge to hop in the truck and go off-roading or camping. You don’t want to have to worry about finding accommodations in the middle of nowhere. Having a trunk tent that fits within the bed of your truck is the ideal solution, giving you freedom to catch some Zs wherever the wanderlust takes you. 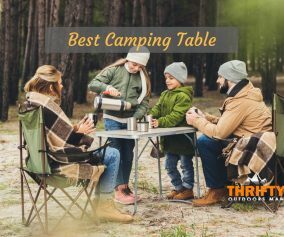 But which trunk tent is right for you? Napier has been creating tents for vehicles since 1990, and those models have always received fantastic reviews. Presently, Napier tents are available throughout the world, with the majority being purchased in North America, Europe, and Australia. Therefore, Napier is easily one of the most trusted brands in the truck tent niche. 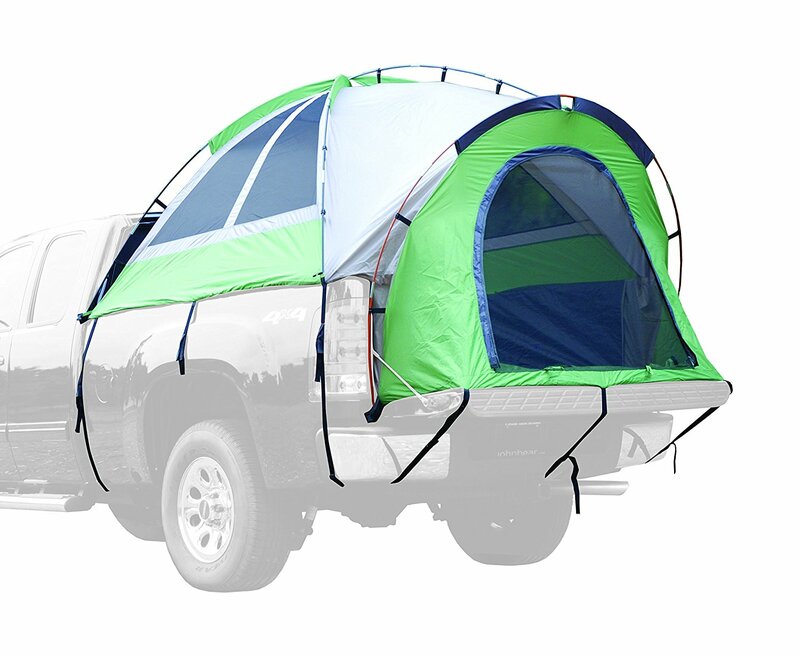 The Backroadz tent has been specially designed to fit within the open bed of a pickup truck. There are also a couple of different models for short-bed, regular-bed, and long-bed pickup trucks, allowing for compatibility with a diverse number of trucks. Installation is rather straightforward and shouldn’t cause any consternation. Included in the packaging are 4 color-coded. shock-corded poles constructed from fiberglass. Simply put the poles in their designated areas the roll out the canvas cover and secure it in place with the straps. 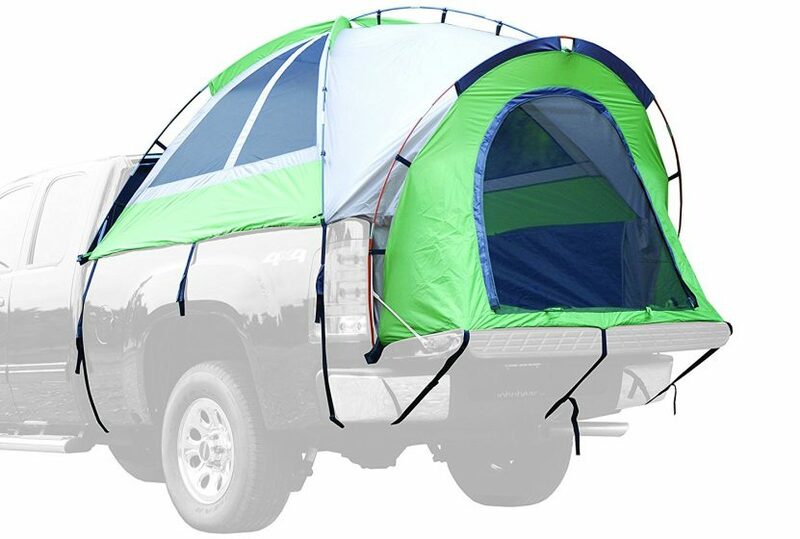 From there, you can attach the tent to the truck’s tailgate for increased resistance to strong winds. Within the design of the Backroadz tent are several positive features that make the design a winner. First, the patented sewn-in flooring adds increased protection from bad weather, as well as water resistance. The comfort of the floor is balanced with the height of 5 feet, 5 inches, for adequate headroom. There is easily enough room for two adults to stretch out and get a good night’s rest. The tent also has 4 windows on the top, rear access for getting items from the truck interior, and a rain fly. For those who love additional storage space, the tent features an interior pocket as well. The exterior of the tent was also thoughtfully created. For example, there are fabric pieces that cover the plastic buckles which could scrape the truck body, preventing damage. 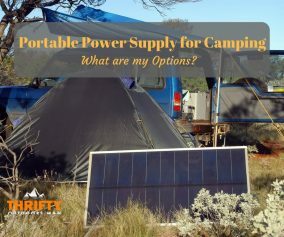 While most Napier Backroadz Truck Tent reviews are generally decent, there are some cons to the design that you should be aware of. Though it is not frequent, other users have reported that the poles are not as durable as you may be lead to believe. 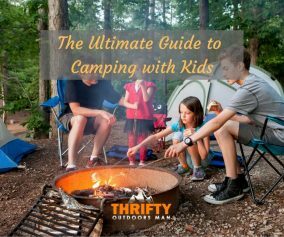 The tent also lacks insulation, so it shouldn’t be used during colder months (but it’s perfect for summer trips). Moreover, the large windows, which are wonderful for natural light and ventilation, can sometimes let in debris on a windy day. Take heed when setting up on a sandy beach. In short, the Napier Backroadz Truck Tent is great for both long and short trips during spring through autumn months. 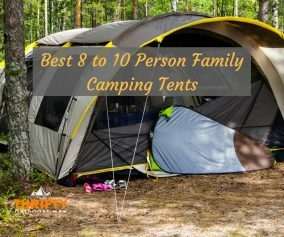 The tent is quick to set up and break down, requiring little effort and know-how. The interior is spacious enough for taller people. The full rain-fly is an excellent feature that protects you from inclement weather. If you’re looking for a reasonably priced tent with great privacy and security, you should consider the Napier Backroadz Truck Tent. Also check out our list of air mattresses for truck beds.